It will be mission impossible for Peter Eke’s men since they will meet a very daunting opponent who is currently preparing for the FIFA World Club Cup in December but the Koloale coach is confident and believes his side will be up to the task. Spirits in the Koloale camp are high with captain, Benjamin Totori, assuring the public that they will be playing for the result that they and their supporters want from their meeting with the Papua New Guinea high flyers. For the Solomon Islands public a win is a must and hopes are pinned on Totori and fellow forwards Ezra Sale, Joses Nawo and Ian Paia to get the job done after a struggling performance from the quartet in their opening match against Lautoka. Koloale may already have a life line being thrown their way with Hekari United defender, Gideon Omokirio, likely to miss the game because he is attending the FIFA sub-regional beach soccer course in Tahiti. Omokirio, a Solomon Islands national, was sent by the Solomon Islands Football Federation (SIFF) to attend the course under his appointment as the beach soccer elite head coach for the Goal Football program to be launched in 2011. That said, Hekari United have additional players who can take up the defender’s place who can match the pace of the Koloale front men and they (Koloale) are refusing to buy into the positives of the absence of Omokirio. 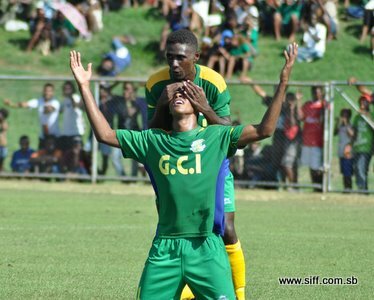 Koloale’s defeat against Lautoka in their opening match at Lawson Tama shocked both the club and football fans in the Solomon Islands but public support for the ‘men in green’ still is strong and many will be looking forward for a victory for their side despite the odds against them. Their match against Hekari United is scheduled for Saturday 13 November.